Matt is a trumpeter, guitarist, composer, arranger and multi-instrumentalist raised in the Sierra Nevada Foothills near Sacramento. At the age of six, he picked up his first guitar and trumpet at the age of 8, beginning his musical journey. He majored in music performance and jazz studies at American River College in Sacramento, California for two years, during which time he was a freelance musician throughout the West Coast. He then went on to earn a Bachelor of Performance from Berklee College of Music in Boston, MA. Matt has performed with and studied under numerous musicians in a wide range of genres including: Angelique Kidjo, Ingrid Jensen, Tiger Okoshi, Gamble & Huff, Salvador Santana, Joe Gilman, Charles Haynes, Dontae Winslow, Jerry Martini and Victor Mendoza. 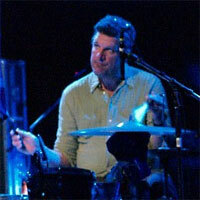 Dave has been teaching music for 31 years, in New York, New Jersey and California. He received a B.A. in music theory and history and a B.A. in psychology from Drew University, and studied drums and percussion privately in New York and San Francisco with Andrew Cyrille, Barry Altschul, Zakir Hussain, Jack Van der Wyck and Richard Perrini. He also plays piano, marimba and guitar. 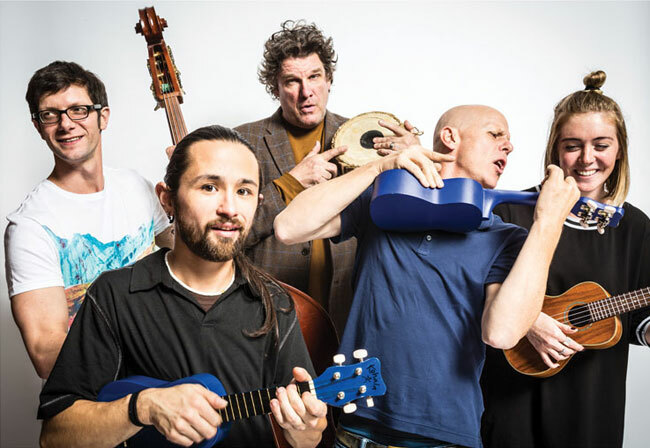 Dave has toured the U.S, Canada, Europe and the South Seas and is featured on recordings by Iron & the Albatross, Jolie Holland, Sean Hayes, After the End of the World Coretet, and his own Shimmering Leaves. His first string quartet was played at U.C. Berkeley’s Center for New Music and Audio Technology and the S.F. musician’s union hall, and he has written for singers, jazz bands, dance bands, rock bands and other idioms. Dave taught music in New Traditions, the Video Drums Clinic, and though the auspices of the S.F. Academy of Sciences. He has had hundreds of students from the ages of 3 through 70 and learns much through his teaching practice. 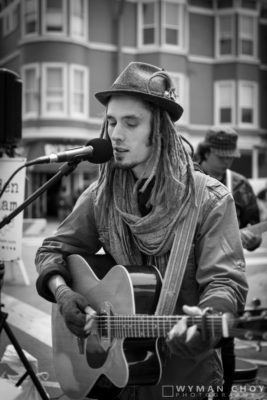 Ayden Graham is a singer-songwriter multi-instrumentalist from the San Francisco Bay Area. He has been performing since his youngest days, beginning with the violin at age 8 and then guitar at 16, fronting his first rock band at 19. Growing up on the music of Sting, Cat Stevens, and The Beatles, he began his career busking in front of the local Three Twins Ice Cream shop. With a regular spot at the Sweetwater Saloon, Graham exploded onto the local music scene as a promising young voice. During two solo trips to Ireland, Graham sharpened his fiddle playing in the pubs and sang on the streets for his supper. From Classical to Celtic Folk, Rock and Reggae, he then branched out into Jazz, Funk and other World music styles. With a hunger for unusual sounds, he delved into the world of experimental electronic music at UCSC and began using synthesizers and looping in his live concerts. Since 2013, Ayden regularly performs at weddings, parties, farmers markets and corporate events using his distinctive blend of genres to create a captivating show. Ayden enjoys sharing his passion for guitar techniques like finger-picking, funky rhythms, and colorful chords with his students, seeking to impart a well-rounded view of music for those that want to explore and find their own unique voice. A trilingual artist, composer and multi-instrumentalist. Originally from Egypt, he listened to and lived in both Egyptian and Japanese cultures during his childhood. He picked up the drum kit at 17 and has been on a journey exploring the different languages of music ever since. Starting from Heavy metal music, he quickly expanded into learning jazz, funk eventually learning piano and composition along the way. 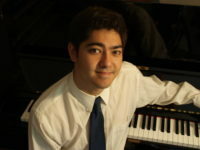 Ahmed has performed in various places around the world, including San Francisco, Philadelphia, Tokyo, and Cairo. He has performed in local festivals with several notable artists in the Bay Area including, Audiopharmacy, Climbingpoetree, Nina Grae, Sasha Bayan, Teao Sense ,and YOURS. His style of playing ranges from Rock, Funk, Reggae, Jazz, all the way to Hip-hop as well as Electronic and world music. Patrick Marquis has been playing drums since elementary school but discovered his passion for Music Composition and Sound Design when he attended the Berklee College of Music in 2008. Graduating with a degree in Electronic Production and Design in 2012, he returned to his native Bay Area and became involved in the local hip-hop scene. After recording and producing 3 albums with various guest artists, he turned his focus on music education and started by teaching high school and adult level Sound Design courses at Berkeley community Media. Patrick found his way into his teaching role with Music for Minors after discovering his love of early education during a demo class interview, facing a group of 30 3rd graders for the first time. Patrick is a recent addition to the Bird School of Music Staff and mainly teaches Piano and Drums. Nikola is a professional opera singer, classically trained as well as an avid performer of jazz and folk music. She has been a classical musician since the tender age of 8. Having started piano lessons and later transitioned to playing organ. At 15 she began playing ukulele and mandolin. She jumpstarted m her singing career after beginning her studies in voice at the San Francisco Conservatory of Music in 2009. Since then she has performed all over the Bay Area with local companies in lead roles such as Opera San Jose, Livermore Opera, West Edge Opera and West Bay opera. She also starred in and created the role of Velma Louise Cole in Boxcar Theaters immersive theater show “The Speakeasy”. She has also performed all over the country and in Hanzhou, Beijing and Suzhou with I sing Beijing. In 2016 Nikola was a resident artist with Opera Memphis, where she also received her Artist Diploma degree in Opera Performance. She now resides in San Francisco where she performs and teaches voice, piano, theater, and movement. 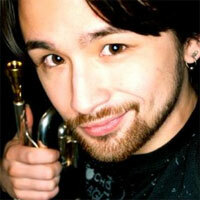 Jesse is a multi-instrumentalist and recording artist who has been playing and teaching for over ten years. Beginning with guitar and then moving on to drums, music has been central to Jesse’s life since age six. A native of the New York City Area, Jesse began playing drums with professional bands at age 17 and went on to study jazz performance and theory at Berklee College of Music. After leaving Berklee, Jesse returned to New York City and helped to operate a recording studio as both a recording engineer and recording artist. Along with Drums and Guitar Jesse also plays piano and bass. Throughout his career he has had the opportunity to share the stage or studio with artists such as: Son little, Mumford and Sons, Eric Krasno, Leon Bridges, X Ambassadors, Shakey Graves and many others. Aside from maintaining an active touring schedule, Jesse remains a student of music and is always looking for new ways to learn.